Seared scallops, the two reasons why I believe that people don’t cook them in their homes often is because they usually aren’t all that cheap. You can buy them frozen as a cheaper alternative then defrost them, but fresh scallops are obviously much better quality. Also, people tend to get intimidated when it comes to cooking scallops. Or lots of other seafood for that matter, such as squid, muscles, clams etc. In fact, I think there are many people who are just big wooses and think “eeeeewwwww…slimey…gross”. Which is a shame because fresh seafood is totally awesome and it cooks so quickly. Especially Scallops!!! 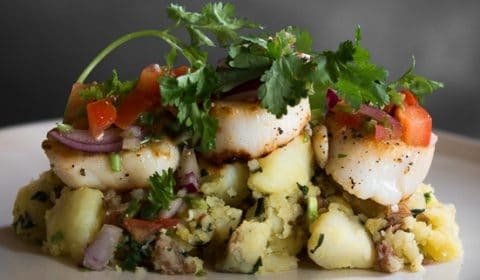 What is the worst thing you can do to scallops? Overcooking them to the point where they just turn into rubber bullets. All they need are a quick sear on each side, so make sure that you follow the recipe and if you are hesitant about them being under-cooked, you can cut inside the thickest one to see if there is any raw flesh. However, that won’t be the case if you follow this recipe correctly. 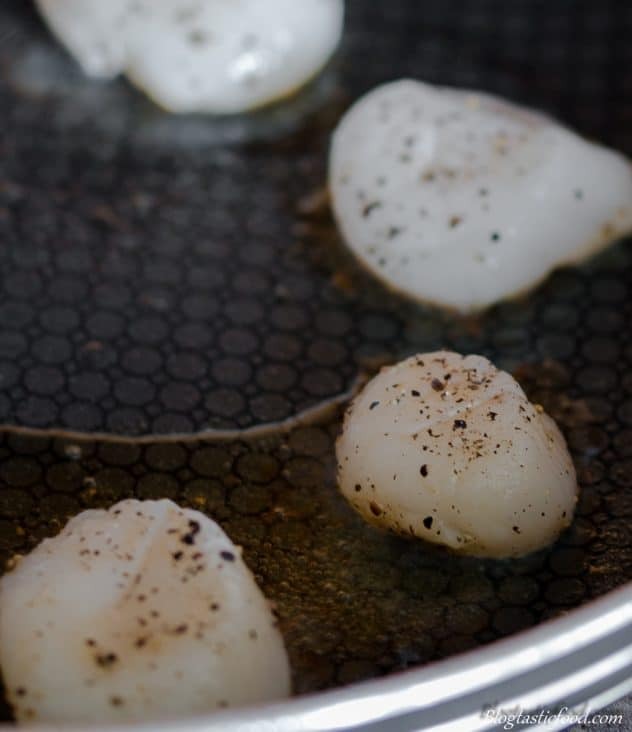 The flesh of a cooked scallop should be a lovely white colour all the way through. I really liked the idea of this recipe as there is a nice balance. You got the heaviness and starchiness of the potatoes. The light, salty meatiness of the seared scallops and then the freshness of the salsa. 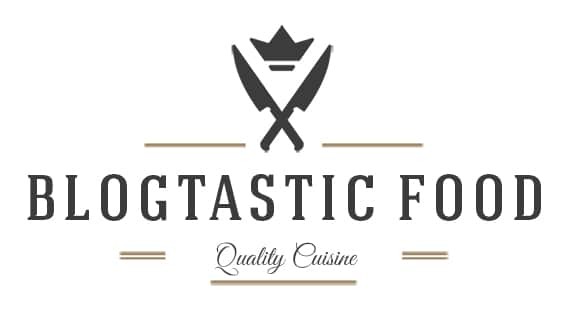 For me, a balance in the food is what makes a good modern style dish. Something to note, the crushed potatoes and the fresh salsa can be made ahead of time. Then you can just re-heat the potatoes when ready to serve. The scallops, however, need to be cooked right before you are about to serve. 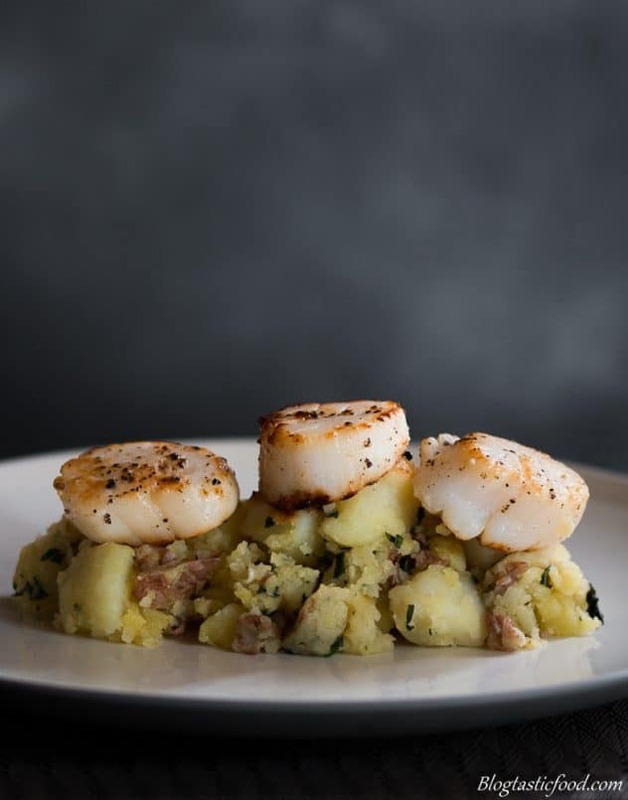 Scallops are just one of those things you have to cook quickly then serve straight away. 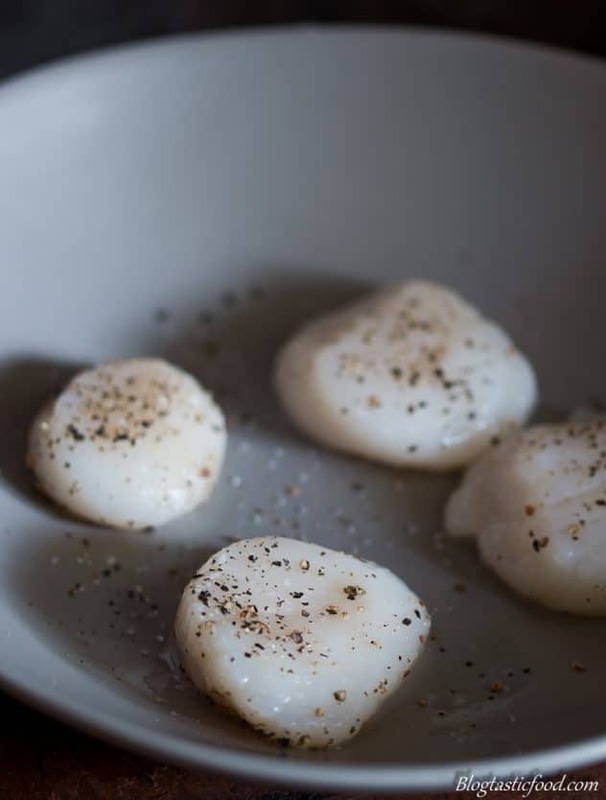 If you try to re-heat a scallop that you have cooked earlier on, you will overcook it and the quality of that scallop will drop by a mile. 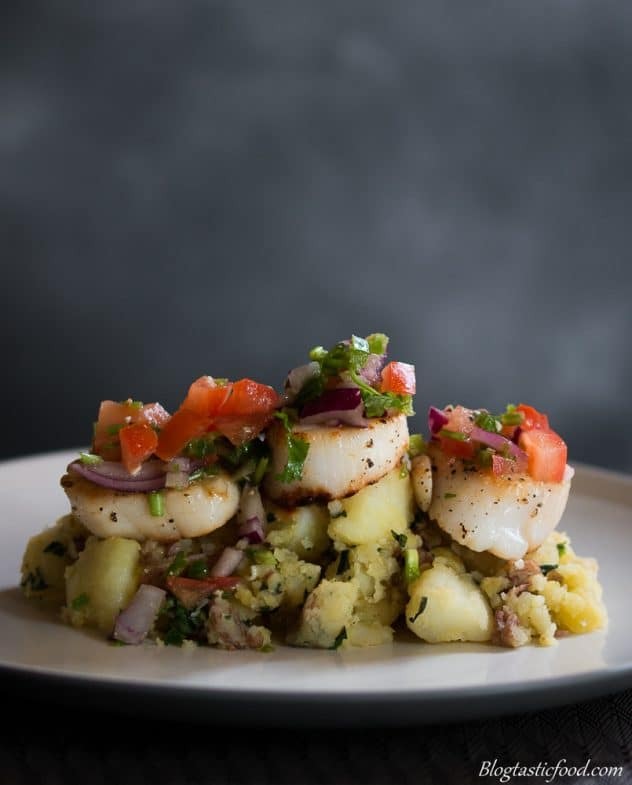 Beautifully seared scallops and a bed of crushed potatoes. Topped with pico de galo. This dish has it all! Fill a large pot 3 quarters high with cool water, then add a good pinch of salt to season the water. Cut the potatoes into inch thick dices then add them to the cold water, get it on the stove and bring to a boil. Once boiling cook for a further 10-15 minutes or until the potatoes are cooked through. Once you are able to take a small knife and easily poke through one of the larger bits of potato without feeling any tough raw potato inside, they are cooked. Drain the potatoes, then get the pot back on the stove on medium heat. Add your olive oil and butter to the pot, then add your garlic and fry it off for about half a minute. Next, at your cooked potatoes and stir through. From there, get a potato masher or a fork and just lightly crush the potatoes. I like to have some small bits, some big bits of and some bits slightly mashed. Lastly, take your mint in one hand, spank it with the other hand, then rip it up and add it to the potatoes and stir through. Turn the heat off an set aside. Season the scallops all over with salt and pepper. Pre-heat a pan on high heat. Make sure you get it nice and hot, then add your olive oil. Start placing the scallops to the pan in a clockwise order (making sure you can hear that sizzle when you add them). This allows you to easily identify which scallop to turn first. 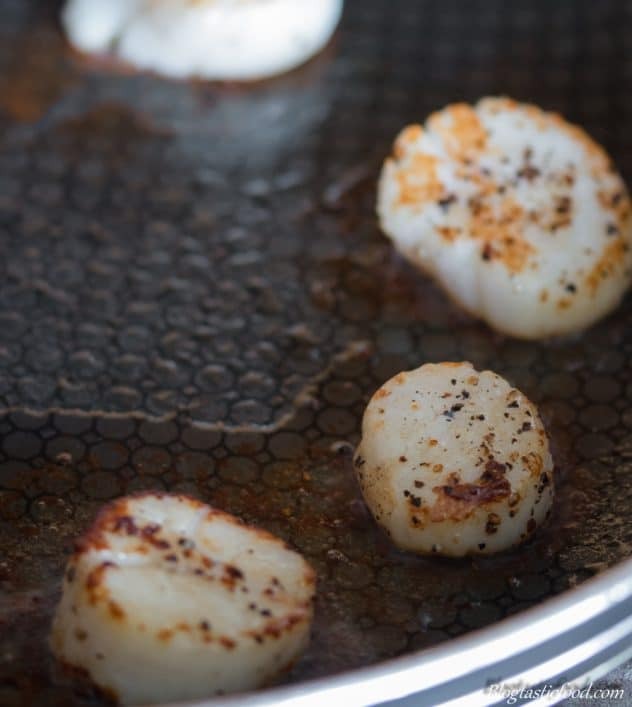 Sear for 90 seconds on each side, turn the heat off then transfer the scallops on kitchen paper to drain off. 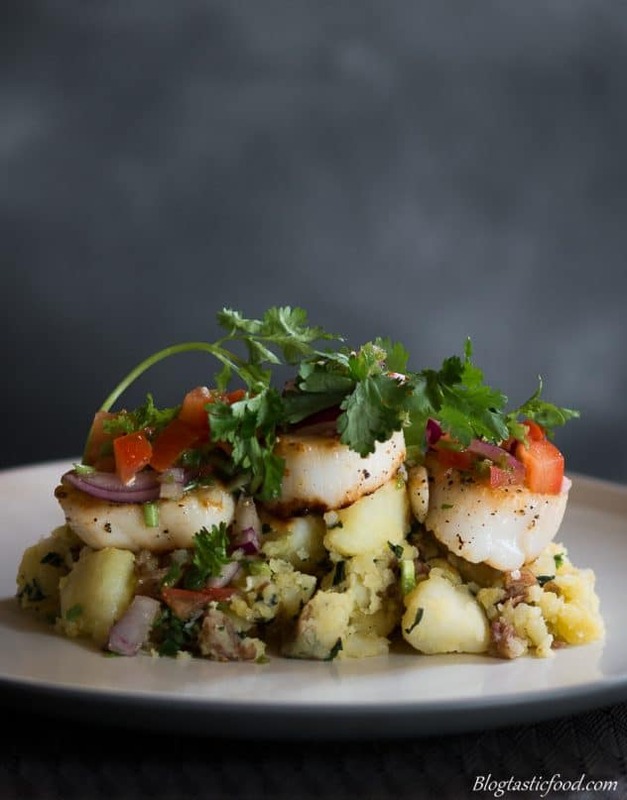 Serve your crushed potatoes on a plate, add your scallops on top, then top with the fresh salsa. Garnish with any leftover mint or coriander leaves. Scallops cook quickly, so be sure not to overcook them. Make the salsa and the crushed potatoes first. Then cook the scallops right before serving. Scallops are one of my favourite seafoods. This looks delicious. Scallops are one of my favorite seafood dishes and this dish look and sounds so delicious. Also, your presentation is lovely. Wow, the scallops turned out perfect! I never can get mine to turn golden brown on both sides without overcooking them. I’m going to follow your directions very carefully 🙂 I think my problem was that the temp wasn’t hot enough. I’m sure the freshness of the scallops make a difference too. Thanks for all the tips.